In this PhD thesis we study the effects of quantum entanglement, one of quantum mechanics most peculiar features, in nonlocal games and communication problems in zero-error information theory. A nonlocal game is a thought experiment in which two cooperating players, who are forbidden to communicate, want to perform a certain task. Zero-error information theory is the mathematical field that studies communication problems where no error is tolerated. The unifying link among the various scenarios we consider is their combinatorial nature and in particular their reformulations as graph theoretical problems, mainly concerning the chromatic and stability numbers and some quantum generalizations thereof. In this thesis we propose a novel approach to the study of these quantum graph parameters using the paradigm of conic optimization. For that, we introduce and study the completely positive semidefinite cone, a new matrix cone consisting of all symmetric matrices that admit a Gram representation by positive semidefinite matrices. Furthermore, we investigate whether entanglement allows for better-than-classical communication schemes in some well-known problems from zero-error information theory. For example we study the channel coding problem, which asks a sender to transmit data reliably to a receiver in the presence of noise, as well as some of its generalizations. Piovesan, T. (2016, October 27). 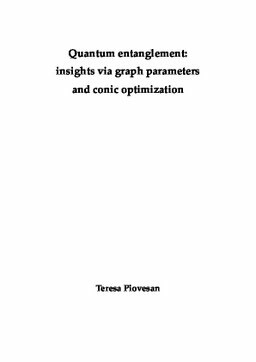 Quantum entanglement: insights via graph parameters and conic optimization. ILLC Dissertation Series.